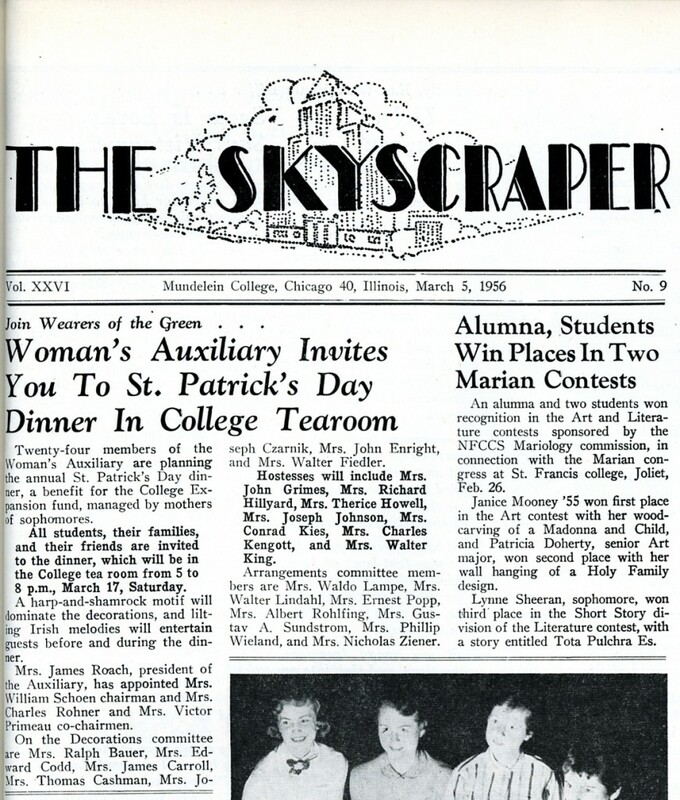 To celebrate St. Patrick’s Day, let’s take a look at an invitation in the Mundelein College Skyscraper Newspaper for a St. Patrick’s Day Dinner held March 17th 1956. * The Women’s Auxiliary planned the annual event as a benefit for the College expansion fund. Note the “harp and shamrock motif” and “lilting Irish melodies.” How I wish they noted the menu, although I assume the meal consisted of the typical Irish American fare of corned beef, cabbage and soda bread. How fascinating that a Women’s Auxiliary and Mother’s club raised money for Mundelein. I wonder if Loyola would be interested in this fund raising idea. Probably not! Front page story from the March 5, 1956 issue of the Skyscraper. Here are two of the participants of the dinner. The photo caption reads “Mrs. 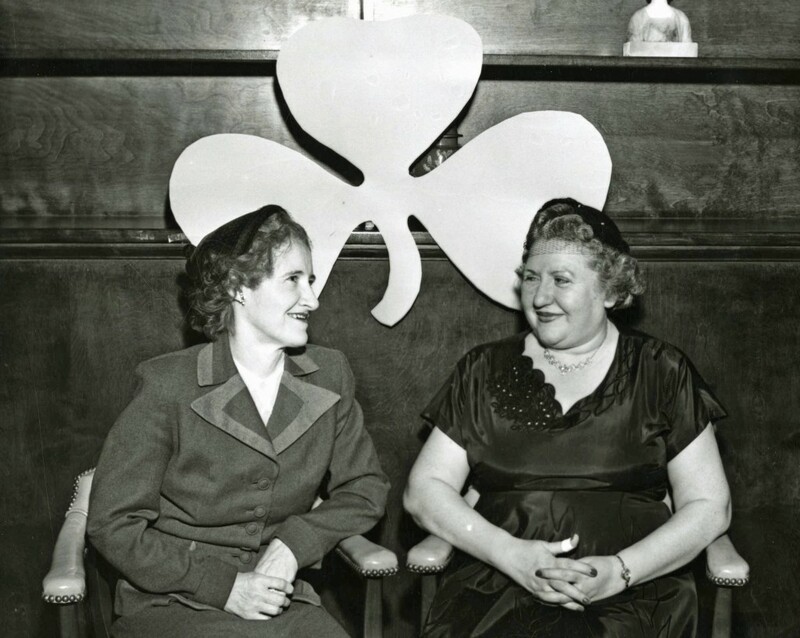 Cahman and Mrs. Popp (pictured left to right) are seated at the Mother’s Club St. Patrick Day Dinner.” The Skyscraper notes the members of various committee and Mrs. Popp helped as part of the Arrangements Committee. How I wish for a color photo to confirm my bet they wore something green. Two women enjoy the St. Patrick’s Day Dinner, 1956. As you read the newspaper article, did you notice that all women are referred to as Mrs. and by their husband’s name? This is almost unheard of now, however, was standard practice back in the day. It’s good to see some traditions haven’t changed from 1956. To celebrate March 17th, wear some green, listen to “lilting Irish melodies” and eat corned beef! Nancy Freeman became Director of the WLA in spring, 2013. Prior to that, Nancy was an archivist and records manager at a wildlife research facility for the USDA in Colorado. Nancy has worked in the archival field since 1999. When not at the WLA, Nancy enjoys spending time with her family and knitting.